I don't know about you, but, with the move towards paperless - I have more and more important things going on my computer. Things with passwords. But, I'm a simple gal. So, seeing as how I didn't want to remember a bunch of user ID's and passwords - I'd just use the same one for everything. Stupid - I know. Then, I started to hear more and more about identity theft. It was time to change my computer ways. 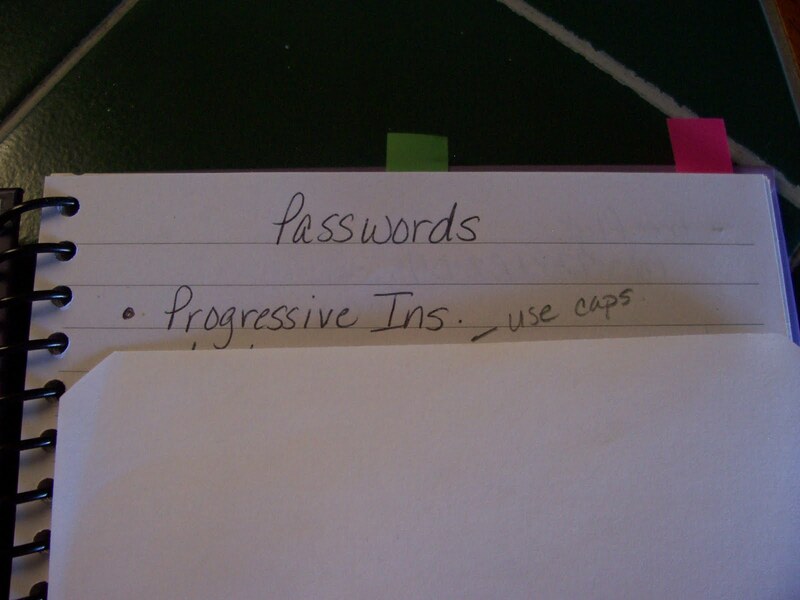 If you have a steel-trap mind and can remember 50 different passwords - I envy you. I, however, do not posess that gift. So, I had to get creative. A friend had given me this blank journal. So, I now keep it by my computer to keep track of all things computer related. I have plenty of space to add more companies and the appropriate info if I need it. Also, I have a couple different e-mail accounts (personal and blog). 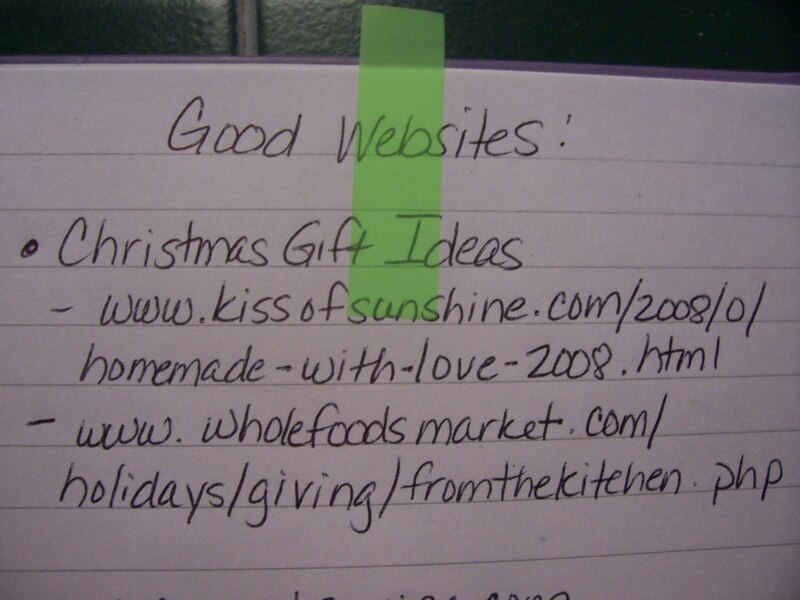 I have these written inside the front flap along with my husband and my son's e-mail addresses. 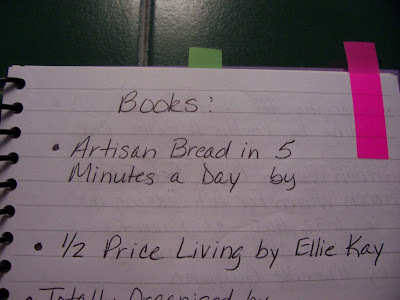 A little ways back in my journal I have a section marked with a sticky tab for book recommendations. Any time I come across a book while browsing or a fellow blogger recommends a book that is on a topic that I am interested in - I write the title and author in this section. I always leave a space in between so I can make notes later. Sometimes, I take my journal with me to the library and write down the location and info on it in this space. 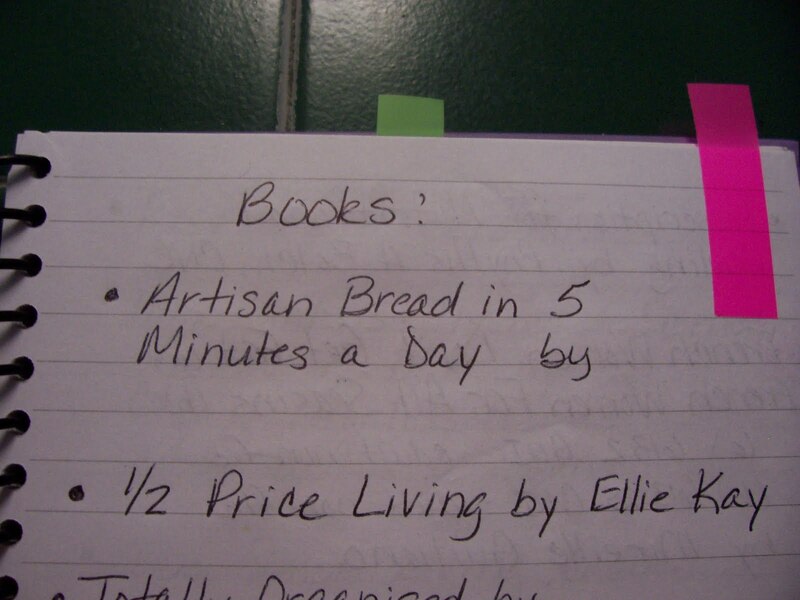 I can also make a note when I've read one on my list and whether or not I want to purchase it for myself. Books I have purchased then get highlighted. The last section I have in my journal is towards the back. I have a section for good websites that I wouldn't necessarily read every day and don't want to clutter my bookmark section with. 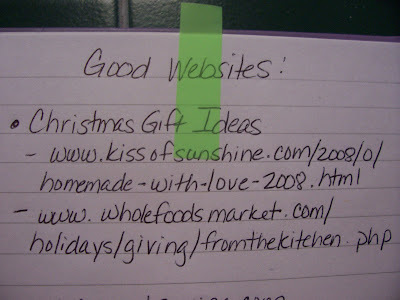 In the example above, I had written down sites with handmade gift ideas for Christmas - definitely something I don't need to see every day. 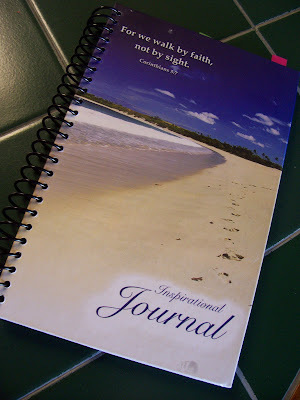 The nice thing about a journal like this is that it is totally customizable to whatever information you need to keep you organized during your computer time. You can also find blank journals really cheap - I picked one up at Goodwill for like thirty-five cents recently. So, tell me, how do you keep track of all of your computer passwords and information? I'm sharing this post at Teach Me Tuesdays. I rely HEAVILY on those features where they send you an email message with a reminder or reset your password. I've thought about keeping a notebook, but just haven't gotten around to it yet. I have a very old address book that my step-mom gave me years ago. In the back note section I have all of my computer password/web page sign on information. I even have T-Rex's because she is clueless when it comes to online stuff. My hubby tries to remember all of his, but he is getting older and we have lost somethings in that mind of his. Since I am Trex I am grateful my friend keeps up with my passwords. I remember some but the rest I forget. I do know my important ones and I keep those in my head and Have them different than just my day to day ones. The main thing is finding a system that works for you. I kind of just stumbled into using a little blank address book that came in a stationery set. I keep my password info for websites, etc. in there, and it small and portable enough to drop in my laptop case while out and about. Probably not the best place for it in case it gets stolen, but it works for me, lol.